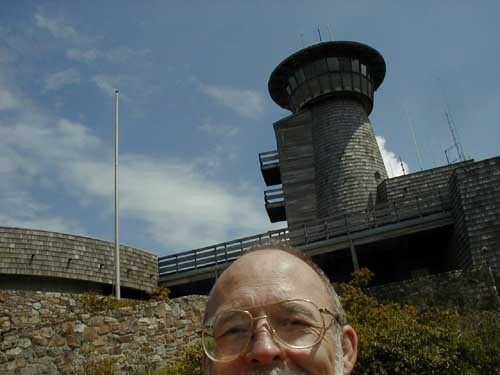 It's me, near the top of Brasstown Bald, the Georgia highpoint. Well, I'm still in Georgia. I expected to enter North Carolina this morning, but when I started hitching up the trailer, I discovered the hitch was broken. I spent the morning dealing with that challenge, then decided to stay where I am (The US Forest Service Chatuge Lake Campground in Hiawassee, GA - just a few miles from the GA-NC border) until tomorrow. It's about time I sent out another report, so writing and emailing this report is my goal for the rest of the day. Next to Americus, where my trailer was parked at the end of the last report, is the little town of Leslie. I decided to walk there to get a feel for the area, and some exercise. Leslie is a quiet little town with a peanut warehouse, a telephone museum, a few small shops, and residential neighborhoods. I noticed a nice house (5 bedrooms?) on a large lot with a for sale sign, so I checked the data sheet in the little box and found an asking price of $145,000 - for a house and lot that would probably sell for $1,500,000 to $2,000,000 in the San Francisco Bay Area. I later spoke with a knowledgeable local lady who told me that the actual sales price would probably be about $85,000. The real estate taxes would be about $400/year and electricity about $150/month. Leslie, GA sounds like an inexpensive place to live, but the summers are hot and humid. This house may sell for $85,000 - you can tell it's nowhere near the SF Bay Area! The telephone museum has an extensive collection of old telephones, but the guide moved me quickly through the museum giving a canned speech and not answering questions then, when I tried to go back and see what I had missed, I was told that I could not be in the museum unless accompanied by a guide. Oh well. This park is on land previously owned by President Roosevelt. It is crossed by the 23-mile Pine Mountain Trail and I decided to hike it which I did with a day hike followed by a 3 day backpack. (The campground is located near mile 7 of the trail. 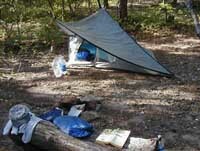 The day hike was from mile 7 to mile 0 and return, the backpack trip was from mile 7 to mile 23 and return.) This was my first backpack trip since I set out in the trailer, and I enjoyed it immensely, even thou' I ended up very tired. The rangers wouldn't let me leave the trailer in the campground while I hiked, but allowed me to park it in their maintenance area free of charge for the 2 nights I was on the trail. My campsite on the Pine Mountain Trail. After Franklin Roosevelt was stricken with Polio, he discovered Warm Springs, and felt that exercising in the water helped him strengthen his legs. Over the next 20 years he returned to Warm Springs 21 times. He built a cabin nearby that became known as "The Little Whitehouse" after he was elected President. The Little Whitehouse is now open to the public along with a museum that tells his life story. He was posing for a portrait in the Little Whitehouse when he died, and that unfinished portrait is on display there. The old swimming pools used by Roosevelt and many other polio sufferers have been restored and are also open for viewing (but not for swimming). I left the trailer in John Tanner State Park in Carrollton, GA and drove to Cheaha State Park near Delta, Alabama. This is a drive-up highpoint - I parked the truck across from the summit tower, and just walked up the stairs. The summit is not very pretty; there is a nice, stone summit tower, a couple of water tanks, several transmitter antennas and lots of wires. Chalk up highpoint number 7. 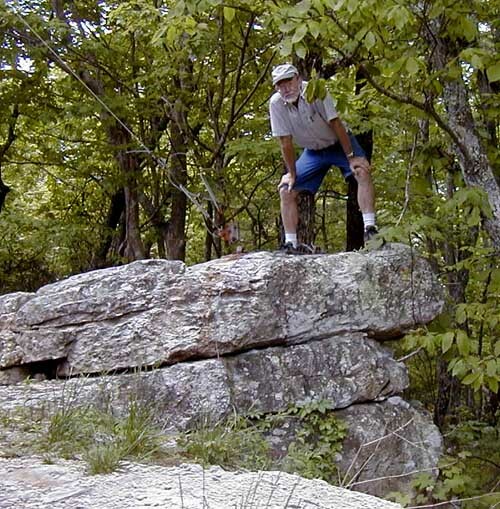 I think this is the actual Alabama highpoint - a big rock behind the stone tower. 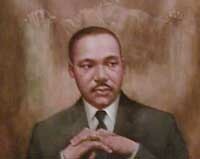 The official memorial to the life and work of Dr. Martin Luther King Jr. 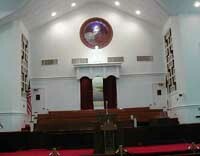 The site includes the Ebenizer Baptist Church, the House where Dr. King was born, His Tomb, and a museum covering his life and his work in the civil rights movement. There is also a section on Ghandi - from whom King borrowed ideas - and on Rosa Parks, the women who wouldn't go to the back of the bus. 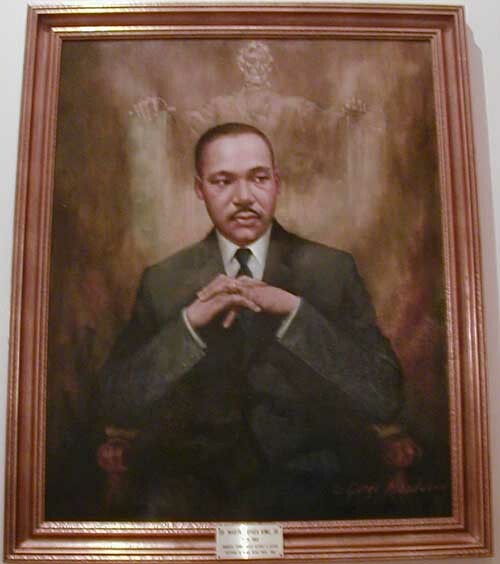 MLK portrait which hangs in the Georgia State Capitol. 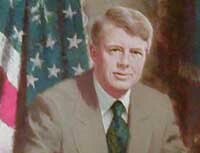 Has very good coverage of the key issues he faced while in office, and a reproduction of the Carter Oval Office. 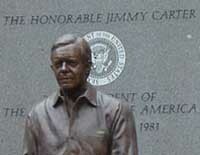 Also on the same site is the Carter Center through which the Carters have been monitoring elections, arbitrating disputes, and fighting disease around the world. Gov. 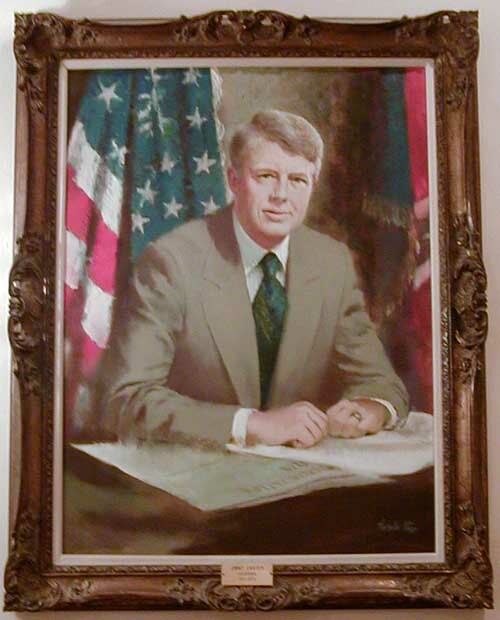 Carter portrait from the Georgia State Capitol. 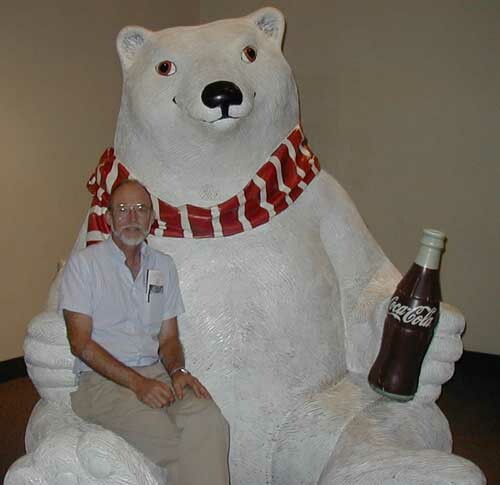 Very popular with school kids, this museum covers the history of Coke and displays a lot of the advertising materials that have been used over the years. I'm not sure why it was there, but there was a Filipino Jeepney just like the ones I rode in when I was in the navy and on liberty from Subic Bay. 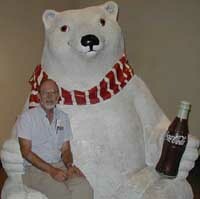 Samples of several of the drinks marketed by Coke around the world are available and I tried a bunch of them. I liked them all to varying degrees with one exception: Beverly - a "bitter aperitif" sold in Italy. It was definitely bitter ... must be an acquired taste. 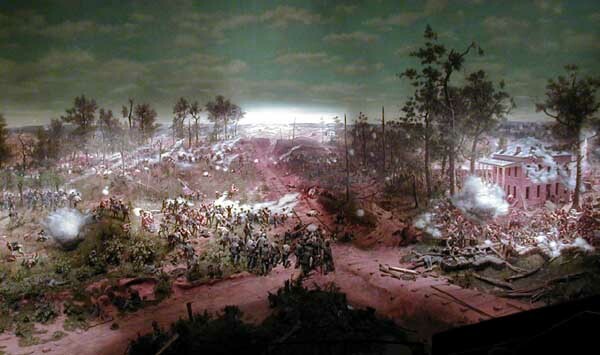 The Cyclorama houses a painting of the battle of Atlanta which took place in 1864 - toward the end of the Civil War. The painting, which is displayed in a circle, is 42 feet high, 358 feet in circumference, and weighs over four and one half tons. Completed in 1886, it was initially part of a touring exhibit. It was given to the City of Atlanta in 1898 and the cyclorama building was built in 1921. Today, there is a 200 seat revolving platform in the center of the building which turns to face each part of the painting as a narrator describes it. A portion of the cyclorama painting. Also on display is the steam locomotive Texas which took part in the 1862 Great Locomotive Chase (also known as Andrews' Raid). This was an interesting look at the role of the Federal Reserve Banks in the US economy, and the history of money. And they gave out free samples of US currency! Of course, they shredded it first. A section of downtown that was built up over the railroad tracks. The old ground level became underground Atlanta, and today it is a series of restaurants and souvenir shops. In one of these stores I had a conversation with a clerk who had come to the US from Iraq about 3 years ago. Her mother and sister both have houses in Baghdad near a former government building which she says now houses the FBI. The building is attacked frequently, and the day before I spoke with her, both her mother's house, and her sister's house had been damaged by rocket propelled grenades or some similar weapon, apparently fired at the FBI. I wish I had been able to visit longer and ask about life in Iraq under Saddam Husein (SP?) but the store got busy. I also found this display of fiberglass cows. The Confederate Mt. Rushmore. 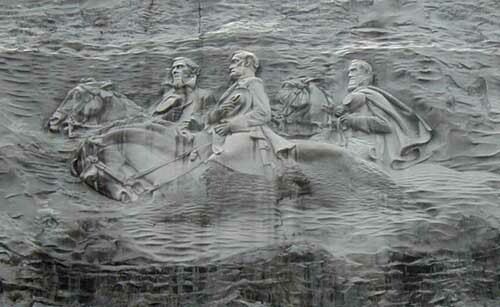 Carved into it's granite face are relief carvings of Confederate President Jefferson Davis, and generals Robert E. Lee and Stonewall Jackson, all mounted on horseback. The mountain is the largest exposed piece of granite in the world. The carving, completed in 1970, is the largest relief carving in the world. And it's not even in Texas! Naturally I hiked to the top of the mountain, then down again to view the carving. 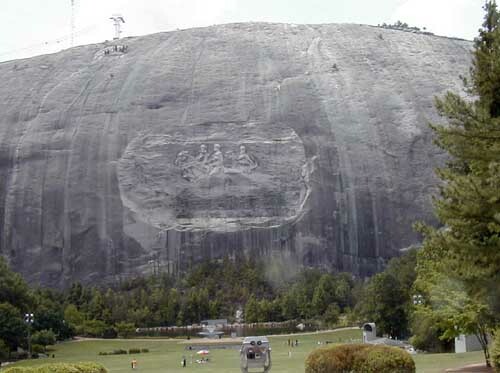 Stone Mountain, Georgia with Jefferson Davis, Robert E. Lee, and Stonewall Jackson. I moved to Dahlonega, GA and visited the top of Springer Mountain in the rain. This is the starting point of the Appalachian Trail, but I only hiked the first 0.9 miles of the trail. It was full of puddles, roots and rocks - looks just like trails in New Hampshire! 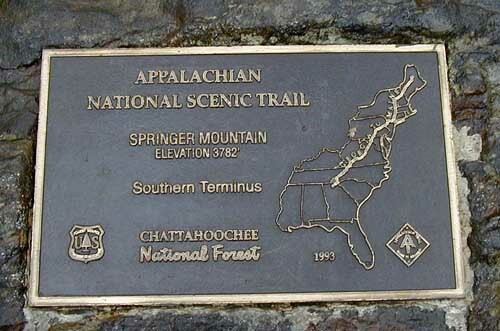 The plaque at the start of the Appalachian Trail on Springer Mountain. At 4,784 feet, this is the highpoint of Georgia. There is a parking lot about 0.6 miles from the top, but I opted to make it a real hike, and walked in on the wagon train trail from nearby Young Harris, GA. 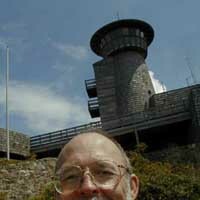 The visitor center and highpoint tower were not open - they open only on weekends this time of year. There was blowing fog and visibility was not good but the view from the observation deck around the top of the visitor center was still worth the hike. And the weather cleared during the return hike. My 8th highpoint. 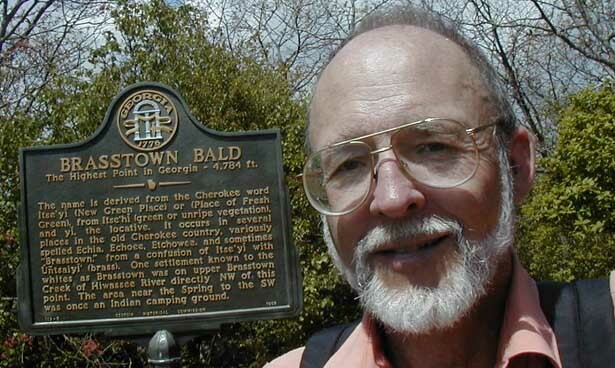 Self-portrait near the top of Brasstown Bald. 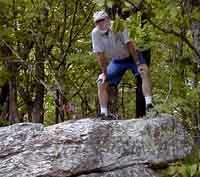 Tomorrow I will move on to North Carolina, and take a day trip to the highpoint of South Carolina, Sassafras Mountain. It's a drive-up; not very exciting. Then comes Great Smokey Mountains National Park and Clingman's Dome, the Tennessee highpoint. And the Blue Ridge Parkway.